Spring has finally sprung in Maine. For the first time in months I spent part of last weekend running errands and shopping while wearing a sweater instead of a winter jacket. It was gloriously freeing to not need a hat and gloves, and I’m happy to say I haven’t had to carry sand with me from the ramp garage to my office for almost a month. Finally, the temperatures are rising and soon flowers will be in bloom. We should even be able to witness the reappearance of our fire pit from under the last two feet of snow still clinging stubbornly to our backyard. Here it is, Easter weekend – that time of year when we ditch the dreary duds of winter and unearth our buried spring attire. Even though those pesky meteorologists are predicting precipitation, we need to remember April showers bring May flowers (not Mayflowers – that’s a whole different holiday). There is just one weather-related habit that I can’t seem to shake after the dreadful winter we endured. I am not done being cold yet. Here I sit cuddled up under a blanket with my trusty, toasty, popcorn kernel heating pad draped around my neck. To be honest, it’s not really a heating pad at this point. 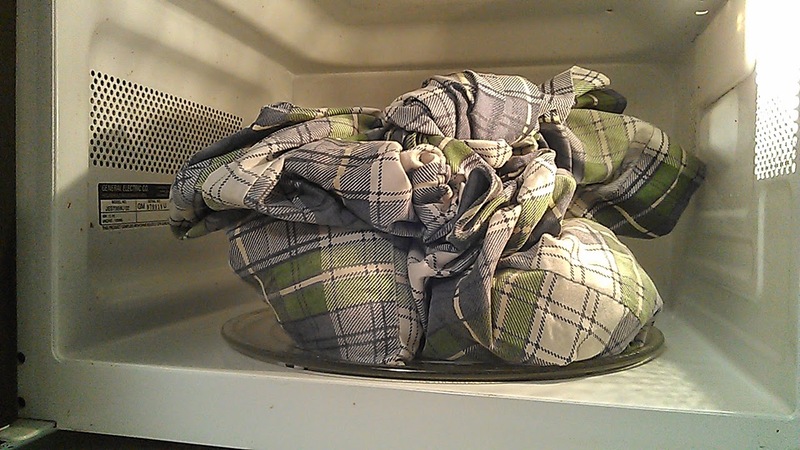 The original flannel cover fell apart after extensive use but the popcorn sack inside remained somewhat intact, except for when little pieces slither out of a slightly worn spot and skitter across the floor. At the moment I have it stuffed into a pillowcase with the end tied in a knot. The whole thing gets periodically shoved into our very tiny, temporary microwave (while I wait until 2017 for the Spouse to replace the cabinets over the stove so I can have a real above-range microwave). For a while the chill is gone and I am in my happy place. Eventually my makeshift heating pad cools down and I have to start the process all over again. The worst is when it’s the middle of the night and I wake up to a heating pad that is chilled by the seasonally absurd cold air. In desperate times I have been known to stand shivering in front of the microwave at 2 a.m., staring at its tiny window waiting for my precious pad to be done. My husband thinks I have a problem. I’ve told him I can quit any time. That is, any time between May and September when supplements to the sun are not needed as much. Don’t get me wrong. You will never see me eager to live in a southern state, you know, like New Jersey. But seriously, I would never survive in Florida’s sweltering heat. I’ll take cold over heat any time. You can always put on more clothes or blankets – you can only take so much off. Still, the older I get the more the cold seems to penetrate every fiber of my being and make the winter months a bit less tolerable. Thank goodness I can have an instant heat source that does not entail cranking up the thermostat or standing in front of the heater vent. My heating pad gets a lot of use in the evenings when I’m watching television or reading or writing or playing a game on my laptop. Just before I head to bed it gets reheated and placed lovingly under the covers so I can climb into a warm, welcoming bed. It’s true, I am somewhat attached to my mangled pouch of pleasant warmth. It certainly doesn’t take the place of cuddling with the Spouse or even having a cat pushing its way onto my lap. It is simply an additional source of comfort while the days have been short, the winds loud and the snowfalls ceaseless. And as I said, I can quit any time. But not yet… May is still four weeks away.